So, for those who didn’t know, I’m a card game nerd. You can imagine my expression when I forgot about the free-to-play “final” installment of magic on consoles. Anyway, forget all that noise. 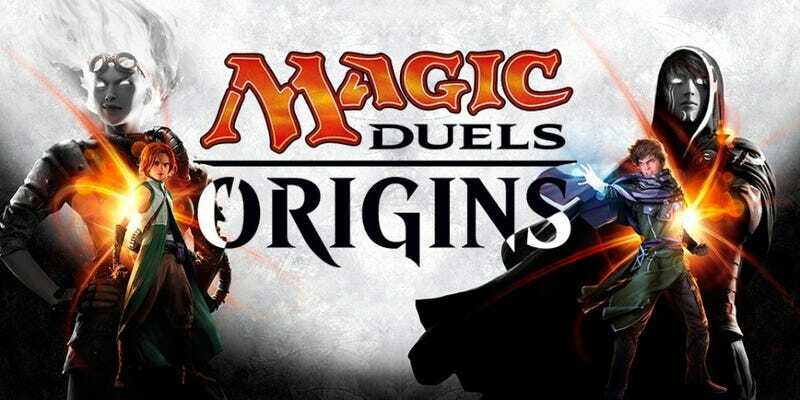 Magic Duels is an answer to the question, i’ve been asking of all annual games. A flat entry fee, and yearly updates instead of a full purchase a year. This time, Wizards has one-upped me, by making it FTP. Gone are the days of yesteryear and the abysmal experience that was Magic 2015 and it’s walled labyrinth of payments. I’m glad they learned. So, Armuun, why should I care? I don’t play card games. That said, it covers 5 mini-stories of the 5 planeswalkers (Read pseudo-money cards and starring characters). It does a pretty decent job of it, as well. Of course, as a card game, you take the role of the planeswalkers to beating the stuffing out of your opponents with digital cards, like so. There are tutorials, of course. Many of you might find playing a new game jarring, but it’s relatively easy to catch onto. And there’s solo practice modes for those not brave enough to fumble around with a friend, or online. Screw that noise. Back to the story mode. It’s difficult, but not so that inexperienced players couldn’t beat it. I myself had a hell of a time playing the first round with Liliana’s deck, until I inevitably triumphed in a few turns. Remember, this is a card game, and card games always come down to a crapshoot, if you’re not playing with decks that cost hundreds of dollars. It’s just how the system goes. Even when you pour money into it, it still kind of is. Anyway, as you progress, you get little crappy CGI clips of the planeswalkers triumphing at the end, which, while they didn’t have to do it, it would’ve been nice to see a little more polish. But hey, you get what you pay for right? Where the free-to-play part comes in. Unless you’ve got lots of disposable income, and, even if you do I would highly highly recommend that you not spend a dime in the in-game store. This is a game that actively rewards you for playing with in-game currency you can use to fritter away on packs, or for the very vain, a foil-y skin for all your precious cards. Take it from a guy who’s sunk wayyyy too much into this game’s real life counterpart (And its competitors over the years), this is not the thing to do. Unlike hearthstone, there’s no competitive tournaments for this, like it’s full-blown big brother, Magic Online. Stay away from that though too, if you can help it. I’ll just throw this out there, you’re going to be playing a lot of games of solo-magic before you even want to step in the arena with some of the pvp players. Just the nature of the beast. Upon opening about a dozen in-game packs or so, I still haven’t stumbled upon a single card that was mind-blowing, or even good enough to build a deck around. Playing for free is slow and arduous, but hard-earned dollars are better spent on bigger games. This is, a timewaster at its very core. That said, I haven’t tried out PvP mode, though I haven’t heard an outcrying of rage from any of my magic buddies. So aside from the normal hiccup of servers, I can’t imagine there’s anything wrong with the game’s mode. If you’re looking for something to while away the time between major releases, you could do worse. Wizards has committed to set-by-set patches, allowing you to play the latest card expansions, for free no less. Unless they pull a 180, this is great news. If anything, this is a tutorial to impress some of your card playing friends with your magic prowess, along with humilating some of your less nerdy friends. What card games are all about. Math, calculations, statistics and alienating those around you to the point where you yourself will question how/if you’ll ever get laid again.